Carlos Rene Cotúc Calvac was 26 years-old when he was selected as a GOJoven Fellow. 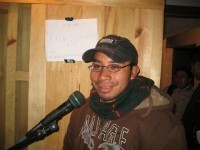 He is a Maya- K’iché who has volunteered as a radio host for numerous community radio stations in Quetzaltenango, Guatemala, including one of 25 radio stations associated with the non-profit association Mujb´ab´l yol. This organization furthers education and capacity-building for children and adolescents, and advances local communication and democratization. Carlos has broadcast programs on health, children’s rights and worker’s rights, and has provided training on sexually transmitted infections and media in schools and local organizations.